Trimetric 2025-RV. A beautiful thing to see for those of us who know. These rules are different from the other guy’s. Aimed at conserving your power and your money. While this is aimed at the RV world, most of it applies to the off grid home world. I know this is too long. Too bad. Everything here needs to be said, because I have to repeat these things to every single person I talk with about solar power. Hundreds of times now, possibly thousands. 1. You must have a real meter to live successfully on battery power. Buy a Trimetric. Period. 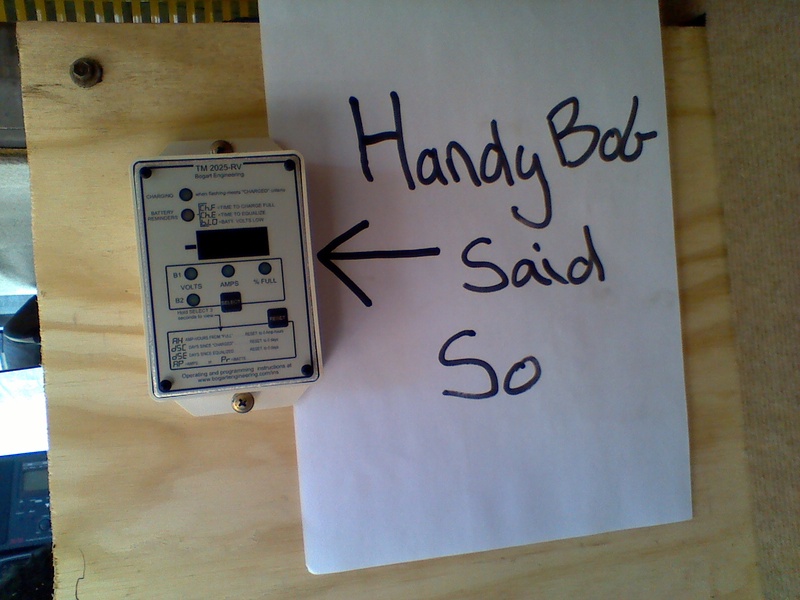 Neither a remote read out for the charge controller or an inverter remote is a real meter. I am talking about a battery monitor that keeps track of both charging and use. Morningstar admitted to me that they take a lot of calls from customers who are asking how to find the battery charge level on their remote. It is not there, being a charging meter and only showing one side of the system. They actually have a meter in development, but don’t hold your breath. They are very conservative when it comes to introducing new products. The built in meter in inverter remotes are usually optimistic. A meter that is optimistic is worse than the opposite because it makes you feel good while you are ruining your batteries with undercharging. One customer who didn’t understand what I tried & tried to explain called Xantrex and they admitted to him that the meter in the remote is just a volt meter, it does not count amps and does not really work. The Link 1000 that is built into the Xantrex remote will work, but it is a complicated thing that most people will never understand. The Magnum BMK does not really work right because of the automatic charge efficiency calculator and it’s 97% limit. I don’t care what they or a couple of those “expert” solar dealers say. The real reason that they sell it instead of a Trimetric is because it is so much easier to install, needs no programming and they can charge just as much money for it. My list of people who now have both a BMK and a Trimetric added later by me is growing, because people get tired of seeing a meter that never shows their batteries to be full, even when they are. You have no idea how much it pains me to say this because I absolutely love Magnum products with this single exception. Regardless, I do not like the idea of having all of your eggs in one basket and even if it worked well, the BMK is harder to look at so you can’t glance at it from across the room to see your state of charge. Buy a Blue Sky IPN PRO with a built in meter if you must, but do not ask me if it works. I don’t know if their meter works and I do not care. I know how well their charge controllers work and I draw the line here. I will not touch them. I have my reasons, too many to list here but if you read the rest of my pages you will find them. I have discovered that there is very little mark-up available on Morningstar and this explains to me the truth about why the dealers push other brands so hard. Yes, there are a lot of Bue Sky owners who love them. Forgive them, they don’t know any better (yet). I had to delete the praise I had here for the MidNite Classic charge controller after a very long and frustrating period of what turned out to be field testing of something simply not ready for prime time. Now in early 2015 they STILL do not have a manual for the thing and I am mighty tired of seeing it having problems. More news will follow some day soon. I love my Trimetric, the big Magnum and the Crown batteries in the power system now running in my shop. Pretty sad when you realize you are in love with inanimate objects, eh? Buy a Trimetric. 2. Look at your meter every once in a while both during the day and at night to see if the amps look right. Charging & loads should be pretty predictable once you have lived on your batteries for a while. If something doesn’t look right, it probably isn’t and you need to figure out why before you have dead batteries. Did you leave a light on in a storage bin? Are you getting the charging you should? Maybe the panels are dirty or there is a battery connection needing attention. One day a few years back I found that one of my panels had failed this way. Notice, if you don’t have a meter, you cannot do this. You need a real meter. 3. Look at your meter every once in a while and check the voltage. Not as often as the amps. This is like checking your blood pressure. Blood pressure goes up and down and voltage is the same. It is not consistent, going up & down like a yo-yo depending on whether you are charging or using energy but it will give you an idea if things are working correctly, or if something is changing and you need to check for problems. The Trimetric 2025 has history recording built in, giving you the ability to look at the last five charge cycles, including highest and lowest voltage recorded. A wonderful trouble shooting tool that I have used over the phone to help people who were hundreds of miles away. Do I need to repeat that you need a real meter? 4. Turn your inverter off when you are not using it. Seems like basic common sense but the number of people I run into who have never been told this or figured it out on their own is absolutely astounding. Inverters use energy, idle current loss. Look at the amps on your meter when turning the inverter on & off to see this. You will also see whatever is plugged into the outlets connected to the inverter, which is sometimes a huge surprise. If you leave it on when you don’t need it, it is just as bad as leaving a generator running. Wasteful. Do I need to repeat yet again that you need a real meter? 5. Do not use a big inverter for a tiny load like charging a cell phone. I have seen people doing this, as well as running a 2000 watt generator to do it. Do not buy a bigger inverter than you need. Bigger is not better, it is wasteful of money, resources and energy. If your rig has nothing but a big inverter, buy a tiny one or a DC cell phone charger. 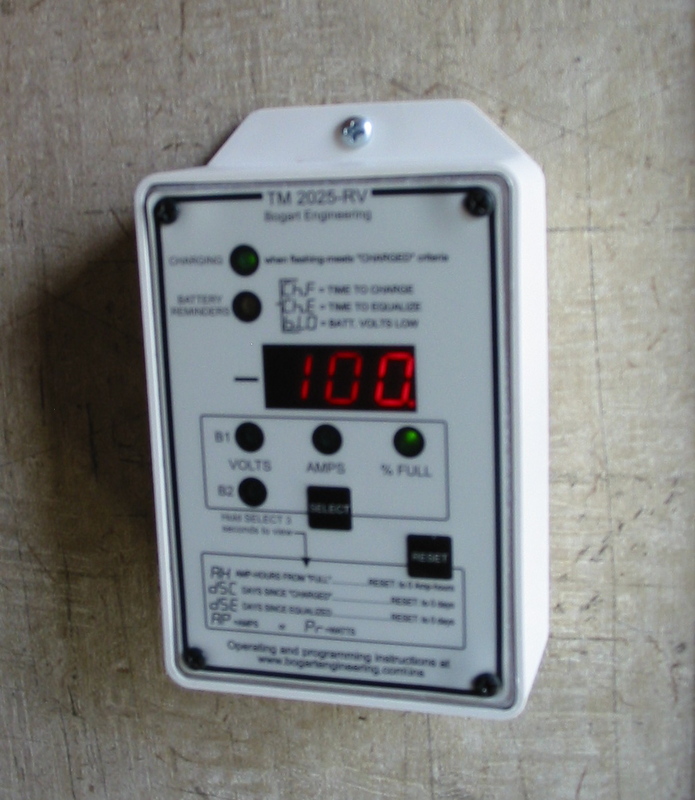 You need a meter to show you this loss, it is not shown on the inverter remote. The cell phone itself is too small of a load to even show up on the meter. You know, that real meter I told you that you need. 6. Develop a check list for heading out to go boondocking. Refrigerator on LP (not auto) or whatever things that need to be remembered in your rig. Every rig is different. Do not listen to some idiot on a forum who tells you that anything is the same in all rigs. Think for yourself. In some the refrigerator will switch to electric when you turn the inverter on. Some have electric water heater elements that do the same thing. These are things you need to figure out for yourself and keep track of them if you don’t want to have problems. Check the meter when you unplug and it will tell you if you forgot something. Again? 7. Look at your meter once in a while to see if you are getting a full charge and use this information to either run your back-up charging early in the day or go into conservation mode so you won’t have to. Checking the charging amps on the meter after starting your generator will tell you if you are wasting fuel because the solar voltage is shutting your charger off, which has to be the most misunderstood thing there is in this world. Egad, not again. 8. It is a good idea to double check that your meter is working correctly by verifying the charge level with a hydrometer. This needs to be done about once a year anyway to verify that all battery cells are the same or if equalizing might be needed. All programmable things can be wrong if not set up correctly and batteries do change over time. Of course if you went to that one “professional” Quartzsite solar dealer you will think that this is wrong, you already threw your hydrometer away and you are certain that you don’t need a meter. Their web site now says they have installed over 7000 systems. I’ll just bet a few of them do actually work, because nobody could do everything wrong every single time. but how could you tell without having a meter to look at? Not again! 9. If you bought into the AGM marketing hype, or if you bought them because you just you cannot get to your batteries to add water, you cannot check your sealed batteries with a hydrometer and you are probably convinced that equalizing is never needed, even though Life Line has now changed their minds and, as well as raising their recommended charge voltage, they are now recommending equalizing. Heresy! Undercharging AGM’s is death for them. A real meter gives you the ability to watch what those expensive sealed batteries are doing and to take good care of them so you might just get your money’s worth out of them. Oh, for crying out loud, the echo here is getting annoying. You need a real meter and you need to know how to use it. Buy a Trimetric. It will improve your life. No, I am not getting paid anything for this. The message is that important. Ask anybody who has a Trimetric. I have installed dozens now and I will not work on a system without doing so. A very close friend has a 2025-RV in his 13ft camping trailer with one solar panel on the roof and only one battery. It spends most of it’s time parked & waiting for him to get a day off. Guess what? He loves it. Plus, he does not carry a generator and he loves that too. Look at what somebody in Australia had to say.